Mcarthys Maze Trail is an ideal venue for a family day out. 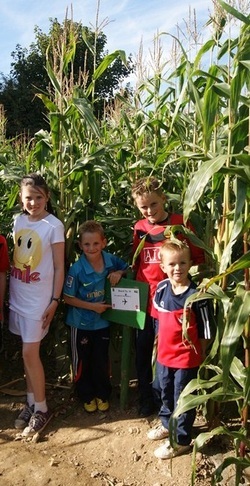 Our Maze Trails are designed each year in a 6 acre field of corn with maize up to 8ft tall. The smaller maze is designed on 1 acre, where you have to find animals hidden in the maze. This takes up 30 minutes to complete. The 5 acre maze offers more complex challenges. You can do the maze to varying degrees of difficulty. Find the bell and ring it and get out again. match to letters and then solve the anagram. so why not take the challenge and have a great time?